Close up so you can see the corner. Repeat Row 3 until you have 42 stitches on the needle. 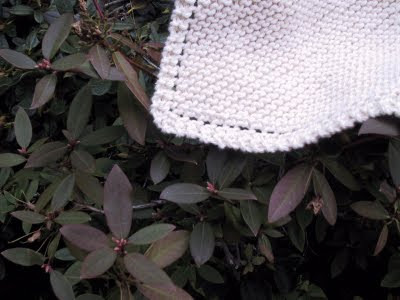 I have always added another knit row at the finish and find taht it helps the looks at bind off. I love this! Thank you for putting so much work into sharing the things you make. I love it. Thank you! I love the pretty patterns of dishcloths and have made a few...but I have never really figured out their function....WHen I use them to actually clean a dish.. it ends up looking and feeling yukky after not much time..am I misusing it ? or doing something wrong ? I know they are fast pretty projects...but what does one do with all of them ? After I use a dishcloth I rinse it out and hang it over my faucet to dry. I run them, along with our kitchen towels, through the washer and drier after a couple days. I have never had a "yucky" one. When I wash my kitchen things I wash them in hot water with detergent and bleach added. Yes they do fade, so I usually make mine white. what do you mean "turn" like turn work? how does this work? I can't wait to try it! Yes turn the work and work the opposite direction. I use Hemp yarn for mine, well some of mine and i can reuse mine over and over before running through the washing machine, the hemp also adds scrubbing texture. Hemp for Knitting Allhemp6 is what i use. Hemp is very sanitary...do a search for hemp and it will explain the benefits of using it. I have friends that say their dish rags get yucky. I NEVER have that problem, I think it is because I use size 9 needles. Since the stitches are not as tight, they rinse out better after doing some dishes. I don't have to bleach or fuss with them. I thing this is my favorite pattern. Thanks for this, looking forward to trying the modifications. Mine always end up looking a bit funny and it bothers me. As for the "yucky" comments, be sure to use 100% cotton. When you wash, don't use fabric softener. Those two things might be why they're going "yucky". Love your pattern, thank you so much. I don't use them to do dishes, I use them in the washroom as a facecloth. They do great for exfoliating. I rinse them out in a running tap when done and hang to dry. I always make a loop at the cast off corner to hang from. This is a pattern my grandma made these at least 25 years ago and I still have some. White or cream work the best, so no fading. My version tweaks the age old pattern slightly to make the corners look some what better. When finished washing your dishes always rinse your dishcloth in cold water. That will help with the "yucky" feeling and any odor. I do not use them for dishwashing---they make wonderful wash clothes. love them for the face. I have made tons of the other grandma's fav. I do not turn, just knit across. I am going to try this pattern. One thing I do is use the scrubby yarns - there are several types and brands. Mary Maxim has one called Scrub It, Red Heart has one also. I use the scrubbies first as I increase. When I start my decrease I switch to my cotton yarns. I find sugar and crème and Peaches and cream to be a waste of time. My fav is Willow Sudsy, followed by Herrschners brand Village Craft, and Premier, also Dishie. The reason I like these better is there is no color fading. It is 15% poly so holds its color while doing the job with the 85% cotton. With the different textures you can scrub tough stuff with one end and the softer end for others. This is such a mindless pattern and knitting on the bias like this make these cloths feel amazing - I think. Thanks for pattern I am going to try it. I have knitting friends who do this pattern starting with 2 stitches. I like the slight modification of your pattern but had trouble with Row. 4. The second YO and K2 tog seemed to leave a hole. 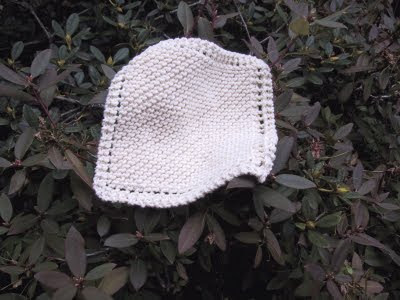 I worked the pattern twice and that happened both times so I just omitted them and the washcloth turned out great. I love the little turns. I make smaller ones in several colors and have them to grandaughters as makeup remover cloths. Saves on stained washcloths from makeup that's hard to wash out. Sorry you are having difficulty, but I don't do videos.